This sandwich makes my husband lose his senses. I only make it for him once a year, on Father’s Day, which I’m sure you’ll understand once you look at the recipe. It’s not exactly the most healthy of breakfasts, but it is delicious! The recipe comes from Sara Foster’s Casual Cooking, but the recipe is so simple that you’ll probably memorize it after making it once. There are a lot of steps, though, so make as much ahead as you can, and then assemble and grill the sandwiches right before serving. Fry the bacon until crispy. Drain on paper towels and set aside. Wipe out the pan. Fry the egg in the same pan as the bacon to desired doneness. 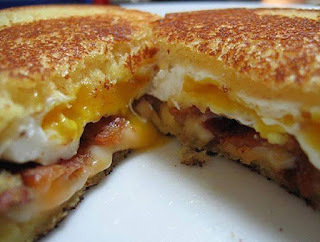 It is best to leave the yolk a little runny, as it makes the sandwich that much more delicious. Heat a flat griddle over medium-high. Butter one side of each piece of bread. 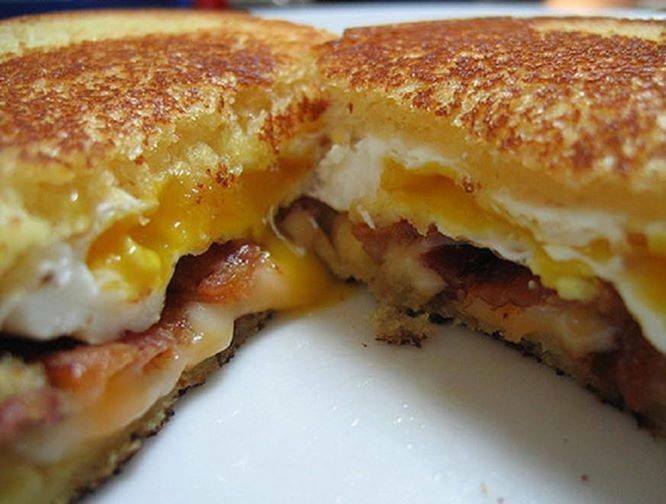 Assemble the sandwich with the cheese, egg and bacon, buttered sides out. Place the sandwich on the hot griddle and cook until well browned. Flip carefully and cook the other side. Serve right away. Notes: If you are making several sandwiches, you will have to lower the heat between sandwiches or they will start to burn before the cheese gets melty.